Formed in 1980, Bluemoon Investigations is a long established private investigation business. 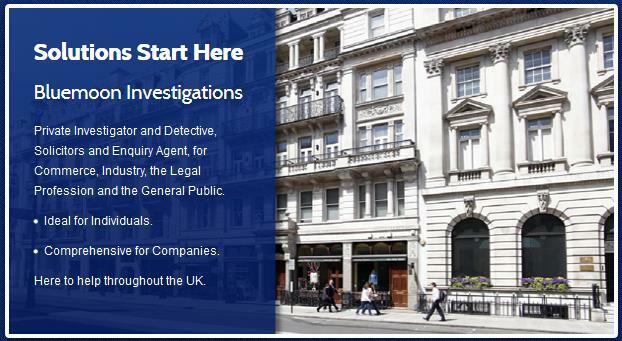 Bluemoon Investigations offers a wide range of services for Commerce, Industry, the Legal Profession and the General Public. Family relationships - partner and matrimonial investigations, surveillance, electronic surveillance, divorce enquiries, vehicle and asset tracking, polygraph lie detector tests. Other relationships - adoption enquiries, domestic staff background checks, spy cameras, peace of mind enquiries, forensic services. Tracing - missing persons, finding friends, tracing workmates, locating missing family, adoption enquiries. Business support - test purchasing, security surveys, close protection, VIP protection, tracing missing persons, polygraph lie detector tests. Business intelligence - due diligence enquiries, competitor intelligence, financial investigations, fraud examinations, lifestyle checks, employee absenteeism.